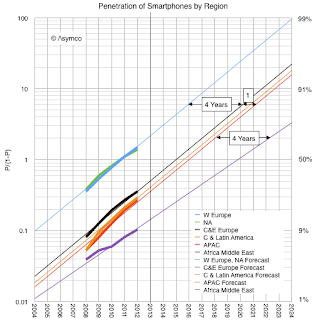 Asymco's Horace Dediu asks When will smartphones saturate? 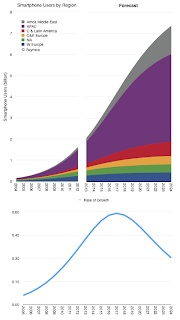 "With the exception of Africa and Middle East, note that the primary difference between regions is not the rate of growth in penetration but rather the delay in adoption. I marked this delay as 4 years between US/EU and Central & Eastern Europe. An additional one year delay to Asia Pacific region and 4 years more to Africa/Middle East adoption. 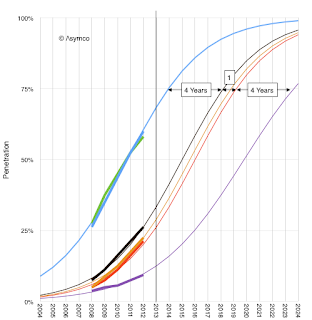 [...] Although 2013 was often cited as the year when smartphones saturated (“everybody that wants one has one”), the total population of users will likely take another decade to reach maximum. The point of inflection in global growth could be expected in 2017. What most observers sensed was the point of inflection in growth in North America and Western Europe. Those regions are 11% of the world’s population."